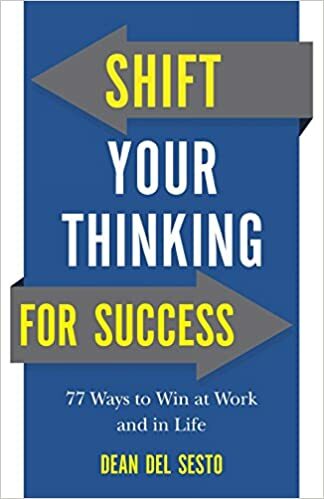 To rate a book on a system such as a five star system takes into account how well, or how bad a book is: for me to say Dean Del Sesto's book Shift Your Thinking For Success is a four star book doesn't mean it's not stellar. Nor do I want to get after the art department for the design of the book, and yet this cover doesn't "Blow me away." I've got to be honest, so here goes. Overall, Sesto's book has a lot of praise and good things within the pages for SYTFS. He provides good, clear communication in how we ought to look at and take inventory of our life to ensure the success we can have. But for those who struggle, who've lost their job, who do a lot of what Sesto says here, end up saying things such as, "I already do all this, and yet..." How do you handle success God's way? Really and truly God provides us the means for our overall good. He chooses how much we have responsibility for and how we reach out to others. Success, in God's eyes, is a stewardship program, an outreach ministry when you think about it. Success is not making a large pile of cash to hoard away. Rather, if we look at the disciples turned apostles lives in regards to this we find that -- like Peter -- some say, "Silver and gold I do not have, but what I have I give you: in the name of Jesus Christ of Nazareth, get up and walk" (Acts 3:6, Berean Study). The success of the early Church, even to now in these modern times, is clearly how much we relate overall to one another in familial love towards one another, how we treat others outside of our respective ministries and in daily living with each other. Success is defined in this way about having, keeping and developing relationships with others, showing the richness and depth of love of and for the risen Lord, Jesus Christ. So, yes, I do give Sesto a four star rating on this book: he does a good job, but the book seems to fall a little on advice to those of us who already employ what he talks about. I received a complimentary copy from Revell of this book in exchange for my honest opinion and feedback.